The Ullinger family of London began with Jakob Ullinger (b. 1833), a musician from Morbach in Bavaria, Germany, who came to London as a young man in the 1850s. During the late 1840s and 1850s, much of Germany was disputed territory and half of continental Europe was at war. Men and boys were being conscripted into the Prussian army, land was being confiscated, and many people were struggling to make a living. So there was a mass exodus of young people from Germany to new countries where they could start afresh. 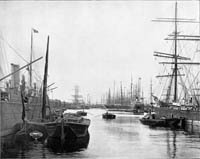 Hordes of Germans took ship at Hamburg for the New World on a promise of jobs and land. Often they spent all their savings on a passage to America and were cheated, and wound up arriving in England instead. The story is that Jakob left home with two other musicians: his younger sister Elisabetha Ullinger, and her sweetheart, Jakob Stass or Strass, who came from the next village, Einoellen. Jakob Ullinger was definitely in England by 1859, so if the younger two did leave with him they'd have been just teenagers, aged around 14. They married in 1870 in Liverpool, so perhaps they left London to try their luck elsewhere when Jakob married.